Hark . . . . it’s Christmas / Unit Costs time! 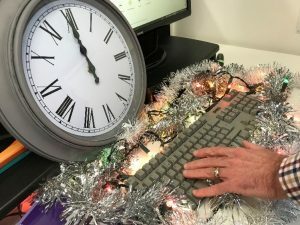 Traditionally, the intention of our Christmas blog is to alert you to the date we intend to publish Unit Costs of Health and Social Care (UCH&SC) so you can be ready and waiting at midnight for Ed Ludlow, our IT Manager, to upload the 2018 edition of the publication onto the PSSRU website. So get ready – December 13th is that date! As you will see summarised below, this year has been a busy one with the addition of several new schema and two new web-based facilities. So read on – and afterwards, hopefully feeling full of Christmas cheer, we would be very grateful if you could take a few minutes to answer three questions (follow the link below) which will help us to see where our work is making a difference. an excel database providing the costs of professionals. This links the unit costs to Agenda for Change bands and job titles and replaces the single excel spreadsheets published last year. All pages of the database are cross-referenced to the Unit Costs report and should be interpreted alongside our methods. a video presentation. Over the years, we have had some questions about how the unit costs programme has evolved which has prompted us to add a short video presentation to our website. This outlines the aims of the UCH&SC volumes and gives an overview of its contents and our online resources. While it touches on our methods, we are working on another video, which will be available in 2019 focussing solely on cost estimation and methods. The first article in our 2018 edition, is written by Tracey Sach and colleagues, and compares two different methods of collecting health and social care resource use data, raising questions about which method is the most reliable. The second article is our own, and was prompted by a report from the King’s Fund on the Rising Cost of Medicines. It looks at how the reduction in the net ingredient cost of prescriptions has impacted on estimates made for the prescription cost per GP consultation; an item we include in the Unit Costs report every year. It may surprise readers to hear that medicines are becoming cheaper when everything else, especially in health and social care, has risen by more than 25 per cent in the last ten years. Further progress has been made on work identified by readers as a priority in a consultation we held a few years ago. In this 2018 volume, there are new costs for a GP online system and sexual health services as well as other policy relevant work. Examples are costs for: smoking cessation, social prescribing, mental health promotion and disorder prevention, a peer support worker and care packages for people being treated for obsessive compulsive disorder. Attention this year has already been drawn to our new home adaptations costs and their relevance to the Disabled Facilities Grants. In the children’s section, the costs of several Children’s Social Care Innovation Programme projects have been tabulated. Particularly relevant this year is Amanda Burns’ blog Unit Costs: the last Chapter, which discussed the ‘cornucopia’ of useful information in Section V of the Unit Costs report. Here you will find NHS staff earning estimates by Agenda for Change band and examples of roles in each band, care home fees, time use for community care professionals and land values. Also the large number of schema which have been withdrawn to comply with our ten year rule can still be accessed from the ‘last chapter‘, aka section V. For those who take inflation indices from the UCH&SC, you will notice in the same section that this year the hospital & community health services (HCHS) index has been replaced by the Health Services (HS) index and modifications have also been made to the Personal Social Services indices. Finally, thanks to the rest of the Unit Costs team – to Jennifer Beecham, who has just returned from a unit costs’ mission in Ireland, Amanda Burns (my co-author) and the production team: James Cordery, Alan Dargan, Sarah Godfrey, Ed Ludlow and Jackie Sullivan. Thanks also to everyone who contributed to this year’s volume. Happy Christmas and don’t forget to click here for the questionnaire!